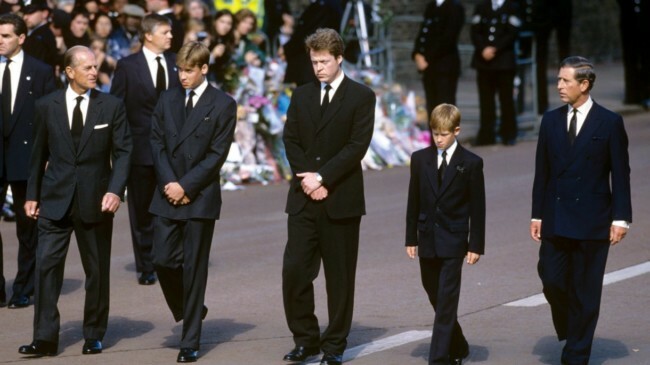 Anorak News | Why did William and Harry walk behind Diana’s coffin? To mark the 20th anniversary of Princess Diana’s death, we’re seen lots of photos of the funeral procession. In today’s Mail, we see the family shot of the young princes, William and Harry, their father Prince Charles, Diana’s brother Earl Spencer and the Duke of Edinburgh. The story of why the princes were walking behind their mother’s coffin seems confused. And there’s Earl Spencer, who told the BBC is was a “very bizarre and cruel thing” for Diana’s two sons to be told to walk behind her body. He says the Palace “lied” to him, telling them the boys had wanted to walk behind the coffin, which, he says, they did not want to do. Not that anything about Diana is new. We’ve heard it all before, sort of. Vanity Fair also prints excerpts of The Diana Chronicles, by former magazine editor Tina Brown, which reveal how the Princess and the Duke of Edinburgh clashed before her divorce from Prince Charles. Philip is claimed to have threatened to remove her HRH title if she failed to behave properly. But the Princess is said to have responded by informing the Duke that her title as Lady, referring to the lineage of the Spencer family, was a lot older than his. Ms Brown also claims Philip cajoled Princes William and Harry to walk with him behind Diana’s coffin at her funeral, overruling objections from her brother Earl Spencer. At least no-one is still harping on about her having been murdered. Which she wasn’t. Right?